This a tale of many players and many agendas. There is no doubt that the green grass as lawn is imbedded into Australia’s cultural life. Many of us grew up in neighbourhoods dominated by streets and parks that were strips of and acres of green. On the surface at least, Australians have come to expect to see green lawns in the suburbs and they enjoy their public spaces, large and small. Surveys by local councils have shown that when parks are to be ‘upgraded’, the one priority always identified by residents is that there must be some green grass. 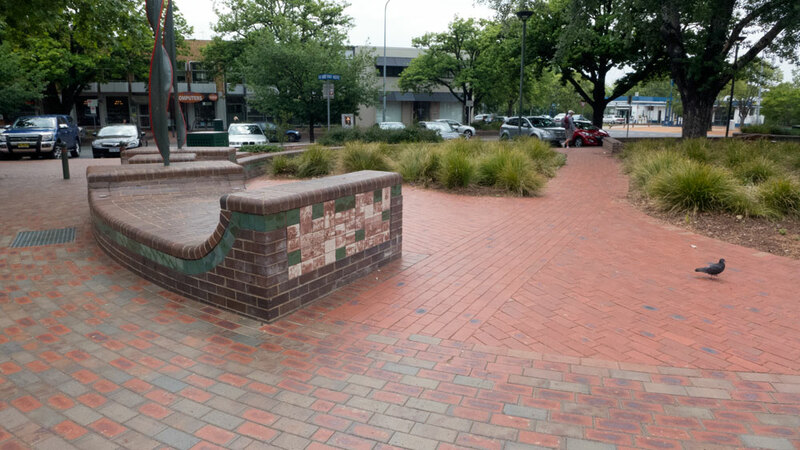 When it is an inner city pocket park, residents will get fired up and defend any patch of grass that they regard as part of their local cultural landscape. It is often assumed that residents accept more complex contemporary designed hard surfaces. Sadly such designed open spaces with lots of gravel and hard surfaces are more popular with the particular landscape designers, but not with residents, especially parents with young children. Below is an example of not so family friendly design. 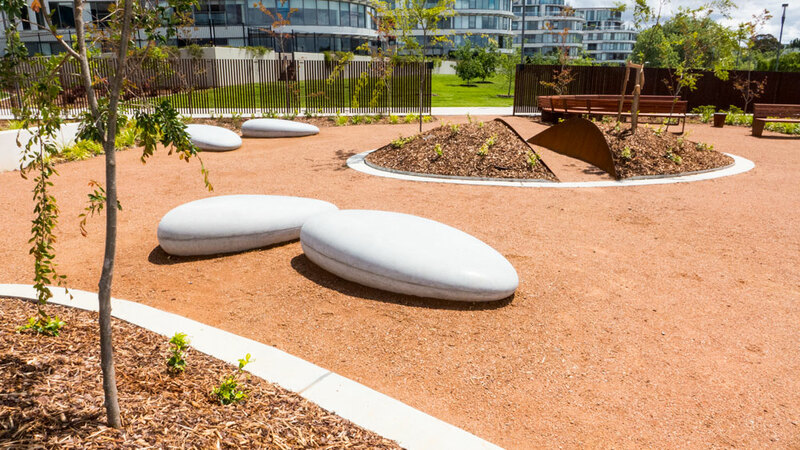 In some city locations, these pocket parks with their green lawns, become the place for busy office workers to stretch out, relax and socialise during their short time away from their desks. Of course all this green provision is to be magically looked after by the local council. This remains one of the challenges of local government – how to finance this maintenance that they see as a luxury, but their rate payers see as required amenity. Unfortunately in recent times, due to droughts and the prolonged periods of high day temperatures, many of these spaces have had their watering reduced, if not cancelled. The result being that they have become parched dead grass, or worse, simply brown dirt spaces. The ACT Government had a dilemma on its hands. A dirt square was not a good look. The government needed to be providing some amenity for both the locals as well as the cafes and shops. They also had to conserve water and to plan for climate change (good). First mistake: The agency in charge overlooked the desire for green lawns. Forget the logic here. 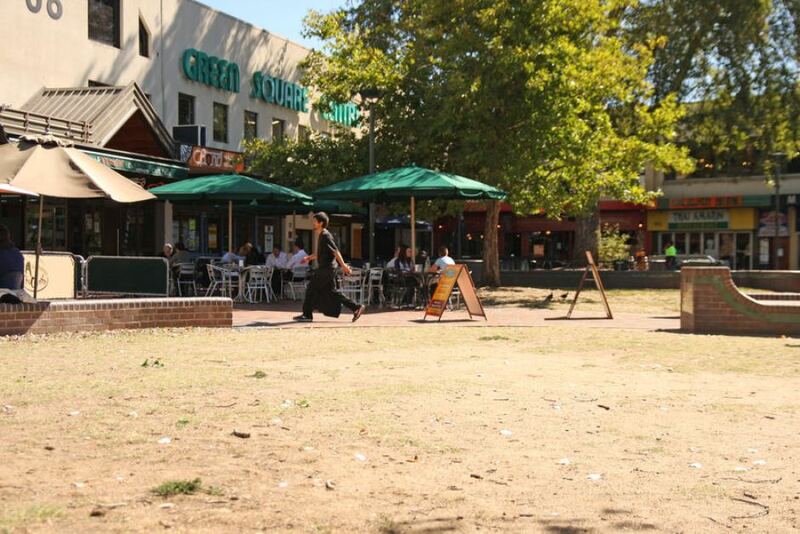 Green lawns have always been part of this Kingston shopping centre. It was the next best thing to being a local cultural landscape. 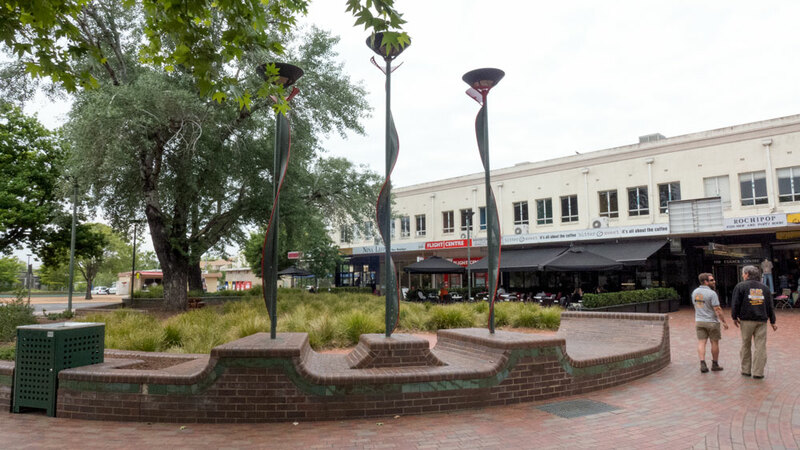 There have been mixed versions published about the initial consultations that delivered the new designs for Green Square. The agency said it consulted while many locals say their desires were overlooked. And so the government spent quite a few dollars installing all the new features and the new ‘spiky’ and drought resistant plants. There was very little grass. It took a little over a year and the negative reactions started to surface. Apparently the traders felt the new work took away from the area’s attraction and they said that there were fewer people coming to their shops and cafes. In fact my observations are that more cafes have opened around the whole shopping centre and some of those are more attractive to particular groups. One of the cafes on the square changed hands, and their new owners have a new menu that moved away from the previous very Italian style. This has reduced their patronage. The presence of the new plants has not really taken away patronage. Some of the cafes remained very busy. 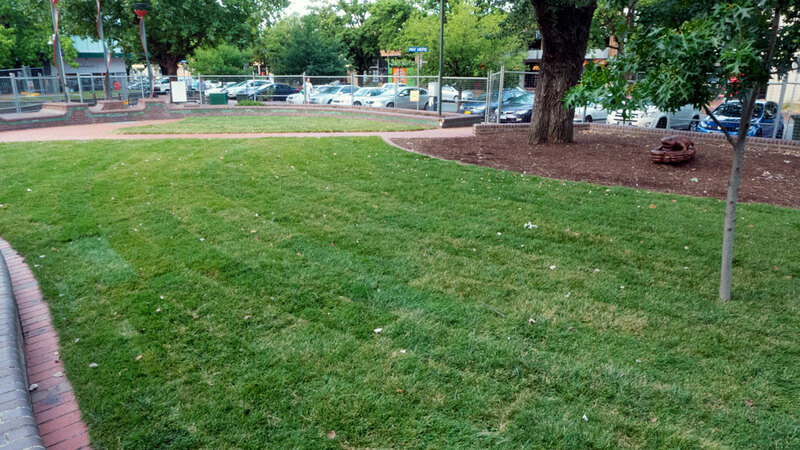 The real thing is that aesthetic and psychological value of previous open green grass (when it was green). It just looked so much more friendly, provided someone kept it green. But then there were the high temperatures and lack of rain – and the need to think about climate change. Eventually early in 2013 the campaign became serious with a petition to the department. Months passed. No answer. Then it turned out that no-one in the department could find the letter. No politician or department head had seen the letter. When this all surfaced everyone, politicians and bureaucrats put out the same prepared spin. Namely that enough money had been spent, the new designed space was to deal with the lack of water, and that the government could not justify any more expenditure. The spin looked like spin, sounded like spin, and felt like spin. It was indeed the sort of spin that government agencies use and usually get away with. Not this time. The locals wanted their grass back. The spin was spin, and was allowed to spin away into the aether. The local newspapers picked up on this and pieces started to appear. The local radio was full of discussion and experts. As usual the journalists had smelt a scandal that would sell newspapers. The local traders were portrayed as the victims and the government as the nasty ones. Local opposition members, Liberal party friends of some local businesses, suddenly became ‘very concerned’ and joined in and managed to get even more column space. One local who specialises in lobbying joined in. I noted he was listed as a local business but his business was not in the main centre but was located a couple of blocks away on Wentworth Ave. He had his photo taken with his two small children looking as though they had been denied the chance to play, as there was no grass just those nasty spiky things. Local traders said it was dangerous for children to play amongst the spiky grass as there could have been dangerous things such as pieces of glass and other nasties. All emotional and political arguments were being used and they were getting reported regularly in the news. I suggest again all this was superficial. The real issue was simply people like grass. My opinion remains that the new landscapes site worked quite well. It looked good. It would require little maintenance. That is, it ticked all the boxes. Logically and bureaucratically it should have been wonderful. But no such luck. The emotional arguments were winning over pure bureaucratic responses and spin. Then the Chief Minister intervened. She took the executive decision to ask the department to re-install the grass. The local traders were prepared to pay for the change. A local grass firm was donating the grass. For a moment all was looking good. But no. The department obviously was not happy so it applied roadblocks. The traders were sent notice of the amounts they would have to pay. This included a huge amount for public liability, I think I saw a figure of $70,000 and then more for on-going maintenance, another $20,000. The local journalists loved it! All sorts of outrage was expressed and everyone had something to say about the stupidity of the department’s attitude. Out came the experts again! I can only image Chief Minister’s, Katy Gallagher, reaction to this resistance from one of her own departments. Among all the voices of complaint, now surfaced a few waste of space academics. They knew that it was now safe to come out of their towers of knowledge and to speak on behalf of the ‘poor’ traders. They were experts after all. As usual their comments were either a complete waste of space or just plain patronising. Totally useless and annoying would be polite way of describing their contributions. Meanwhile as the experts were doing what experts do in such cases, not much, and the media was having fun, the politician in charge had actually called parties together and solutions were identified. Announcements followed that the grass was to be replaced immediately and costs shared, with only minimum and reasonable costs to be covered by the traders. 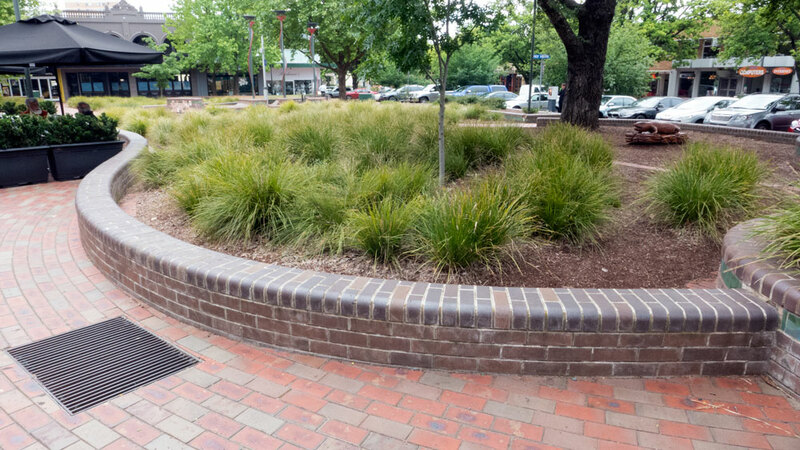 The former spiky plants were removed on the Tuesday after Australia Day. By Friday the irrigation was in, new earth down and the grass laid. All done and everyone was happy. Click here for the Canberra Times story. When I last visited the site the temporary fences were still in place waiting for the grass to settle. With the new brick infrastructure, walls and paths and the new seats (all as before), with the addition of the grass, I have to say place is looking like a park again. It looks like a place you would call – Green Square. I am sure all the locals are very happy. Not so sure about the bureaucrats in the landscape department of the ACT Government. They definitely got this one wrong and their numerous mistakes and presumptions had compounded the problem. The locals had become emotional. Simple logic went out the window. I still suggest that local businesses were not really suffering because of the lack of lawn. There are changes to local activity given the growth in other business around the whole centre mainly on the other streets and that some of these new and revamp businesses have attracted customers away from Green Square. But I have to admit that this has been fantastic advertising opportunities for the traders on Green Square. They have had loads of advertising and commentary courteous of all the articles in all sorts of media. On that basis, well done traders, you have used this string of bureaucratic mismanagement to your commercial advantage. 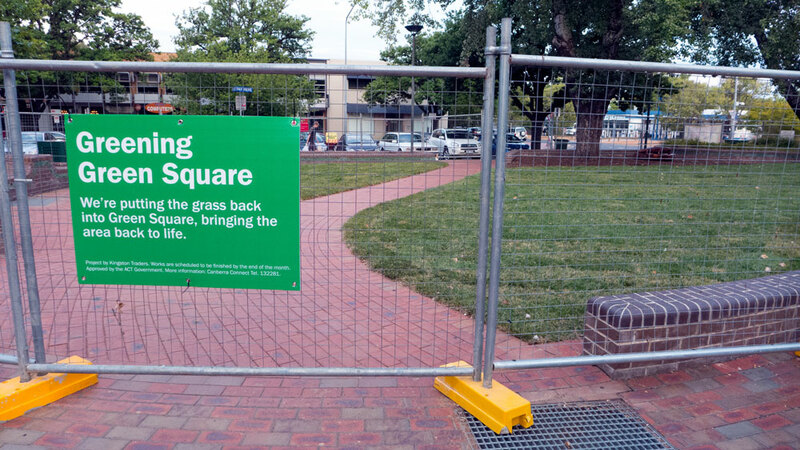 I bet almost everyone in Canberra now knows about Green Square and that there are cafes and shops there – and there is now a lovely green Green Square again. Yes, Green Square is a very pleasant place to visit. Full marks to Katy Gallagher (Chief Minister). She saw through the crap and saw what the real emotional issues were and took action. It was really that simple. All local government parks, recreation and landscape design sections be warned. Locals like their green grass. It is really that simple. Paul Costigan, 7th February 2014.